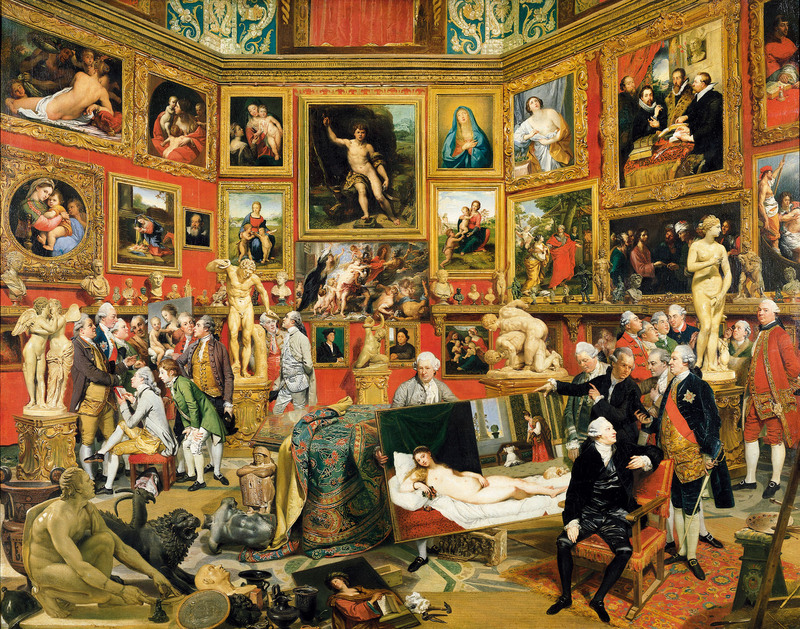 A new evaluation of Johan Zoffany at the Royal Academy of Arts. A new evaluation of Zoffany at the Royal Academy of Arts. The exhibition “Johan Zoffany RA: Society Observed” is a new assessment of the work of the German painter. The Royal Academy exhibition highlights Zoffany as a cornerstone of the English artistic culture of the eighteenth century. It features over 60 paintings and a selection of drawings and prints from British and international public and private collections, a number of which have rarely or never been exhibited before. Of Bohemian origin, Zoffany was born Johannes Josephus Zaufallij near Frankfurt am Main (Germany) on 13th March 1733. Famous for his portraits, in the 1740s he began to study in the sculptor workshop of Melchior Paulus in Ellwangen. Later, he moved to Regensburg and studied under the artist Martin Speer. Arranged thematically into eight sections, “Johan Zoffany RA: Society Observed” opens with an exploration of his art in the 1750s when he trained in Rome – entering the studio of Agostino Masucci. He worked for German patrons, including the Prince-Archbishop and Elector of Trier, producing history paintings in the grand style. 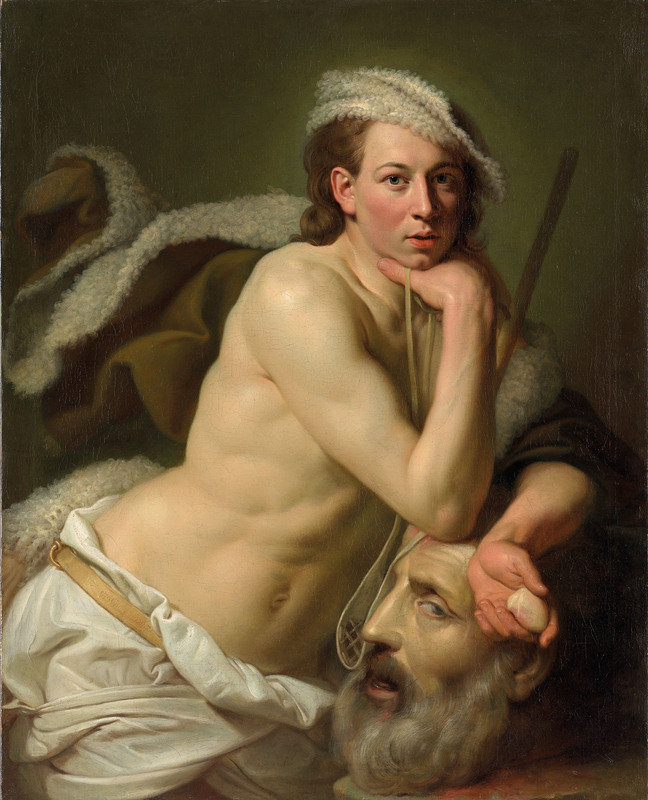 A highlight of this section includes an astonishing allegorical painting of David which has been traditionally considered to be a self-portrait. Johan Zoffany migrated to London in 1760. He was totally involved in the British art and culture environment that provided many patronage opportunities for him, including the court of George III. At “Johan Zoffany RA: Society Observed”, the section ‘Garrick and the London Stage’ examines his portraits and representations of the theatre showing Garrick and other famous British actors. In 1762, in fact, Zoffany was introduced to the actor David Garrick. The room reveals Zoffany‘s ability in depicting the excitement of live performance on canvas, in the context of the theatrical revolution spearheaded by Garrick. Zoffany was a Freemason. He was initiated on 19th December 1763, at The Old King’s Lodge No 28. At the Royal Academy exhibition, the section ‘The Court’ focuses on the importance of patronage in Zoffany’s portrait career from his introduction to the Court of George III in the early 1760s to his portraits of the family of the Empress Maria Theresa. Highlights in this section include ‘Queen Charlotte and her Two Eldest Sons’ (1764-5) which demonstrates Zoffany’s innovative treatment of royal sitters by placing them within a domestic setting. Zoffany, a founding member of the new Royal Academy in 1769, enjoyed great popularity for his society and theatrical portraits. He was a master of what has been called the ‘theatrical conversation piece’, a sub-set of the ‘conversation piece’ genre that arose with the middle classes in the eighteenth century. The conversation piece – or conversazione – was a relatively small informal group portrait, often of a family or a circle of friends. This genre developed in the Netherlands and France and became popular in Britain from about 1720. At the “Johan Zoffany RA: Society Observed”, the sojourn of Zoffany in Italy from 1772 to 1779 features in the room ‘Italy, Old Masters, and the Antique’, exploring the ways in which Italy impacted upon Zoffany’s visualisation of the collecting of antique statuary and old master paintings. From this period is his greatest painting, ‘The Tribuna of the Uffizi’ (1772-7). The section ‘Families and Friends’ presents Zoffany’s approach to portraiture as commissioned by aristocratic and bourgeois sitters whom were coming from the countries he visited. Developing the full potential of the group portrait as ‘conversation piece’, these works celebrate informality and sociability, and reveal the dynamics of ordinary, everyday family life. Often placed within grand interiors or on landed estates, these group portraits confirm the social and economic standing of sitters drawn from the world of politics, commerce and the arts. The room ‘Revolution, Reaction, and Retirement’ focuses on Zoffany’s career in the 1790s after his return from India. His most ambitious paintings of this last period were the two pendant pictures portraying acts of barbarity perpetrated during the French Revolution; ‘Plundering the King’s Cellar at Paris’ (1794) and ‘A Scene in the Champ de Mars, Celebrating over the Bodies of the Swiss Soldiers on the 12th August 1792’, with a ‘Portrait of the Duke of Orleans’ (1794). Their shocking subject matter reveals the intensity of Zoffany’s response to recent events in France. He worked once more in England, until his retirement around 1800. Zoffany died dying at his home at Strand-on-the-Green, 11th November 1810. He is buried near his home in the churchyard of St. Anne’s Church, Kew. The painter Thomas Gainsborough was, by that artist’s own request, later buried nearby. 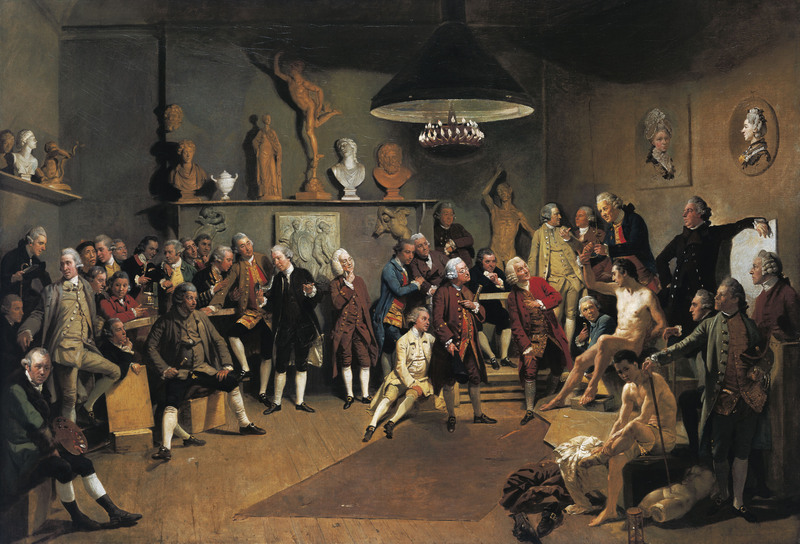 “Johan Zoffany RA: Society Observed” gives a different perspective of the German artist. The Royal Academy exhibition is for lovers of the eighteenth century art, for those interested in social aspects of the period. “Johan Zoffany RA: Society Observed” has been co-organised by the Royal Academy of Arts and the Yale Center for British Art. The exhibition is curated by Martin Postle, Assistant Director for Academic Activities at the Paul Mellon Centre for Studies in British Art. The organising curator at the Yale Center for British Art is Gillian Forrester, Curator of Prints and Drawings, and, at the Royal Academy, Mary Anne Stevens, Director of Academic Affairs. It is supported by Cox & Kings. From 10th March until 10th June 2012. At the Royal Academy of Arts, Piccadilly, London. « Korean Contemporary Art at the Moorhouse.